I know I have covered this topic already in earlier posts but I just wanted to stress ‘again’ how powerful a forum signature can be when wanting to either: A – Get your links or pages indexed fast, or B – Get a boost in your Google rankings. Now I’ve tested this time and time again and this technique works EVERY time. In order to use this technique though you must be a member of a popular forum which offers dofollow links in your signature AND you must have a decent number of recent posts. The more posts you have within the forum, the more backlinks you will have scattered throughout multiple threads and pages, all of which can be updated within a minute or two via your profile controls. As you know, last week I released a video and posted it on my thread showing you how I use one of my apps to find keyword rich domain names. Now, for some reason, Google always seems to like my posts. They get indexed within a minute or two and they rank quite well naturally. 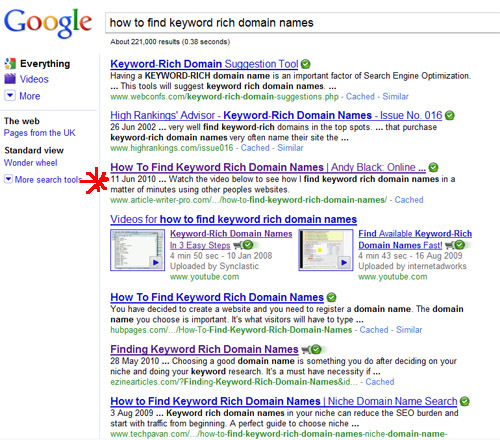 Anyway, my last post got indexed and ranked at around no.35 for ‘how to find keyword rich domain names’. 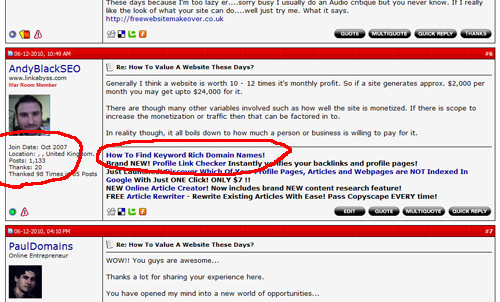 Anyway, two days ago I decided to add a link to that post on my Warrior Forum signature using the anchor text ‘How To Find Keyword Rich Domain Names’. Now I know that this isn’t a mega competitive keyword phrase but this is just to illustrate the usefulness of signature links when used correctly. I checked this morning, just 48 hours later and that post now ranks at no.3 on Google for that phrase. It has been given a ‘large nudge’ because of the anchor links in my forum signature. So, how does this work? Well, I currently have 1,133 posts in the Warrior Forum. When I add a new link to my signature, that link will be automatically populated across ALL the posts that I have ever made in the Warrior Forum. As Google indexes these posts or re-caches these posts it will find these new anchor text links pointing to my post and in turn, applies more weight to my rankings. I will monitor this and see if the rank increases throughout this week. You make a lot of sense–except that it takes so much time to make 200 – 1,000 posts to a forum. I remember the hundreds and hundreds of hours I spent (honestly) posting my 40+ websites to the dozens and dozens of directories and then bookmarking all of the pages and sub-pages. Talk about painting a house with a toothbrush! Thanks for the tips Andy, it makes good reading from an experienced SEO expert. I was wondering one strategy from so many days about forum signature links..How about this trick… posting 200 – 1,000 post in your respected niche forums say about 10 to 15… WITHOUT adding signature links to your posts thus creating authority & gaining respects…. after some safe waiting period say about a month put your signature links with a anchor text…. it is possible to do so???? A good point Andy. Is there a quick way of checking whether a forum is DoFollow? I used to have a function on my browser but it seems to have gone. Checked You are Number Two now! The answer to your question is yes BUT it takes a while for your rankings to drop and it doesn’t drop significantly. I’ve noticed a month or so later that my rankings have barely moved yet found that I’ve increased my ranking for my new ‘anchor text’. Google will not visit all your posts / pages in one go. It may takes a month or two before ALL threads have been crawled and re-cached. This method of backlinking is particularly good if you have a product launch or are wanting to get a particular page to the top for any specific promo etc. That’s why it is handy to have a number of posts in a handful of forums. Then just post even once or twice a day on each forum to ‘stay’ fresh. You will also find that you’ll probably get lots of traffic directly from your signature links. Two birds with one stone. thanks, Andy for that great post.well from now on I will spend more time in the forums and try to build more back links. I got to do what i got to do cause i don’t want to go back to the 9- 5. We all know if it was easy so every one would do it. so got to man up lol.